Since my beautiful car passed it's MOT and I no longer had to save any money towards it, I decided I would go and treat myself with a trip to Primark and since it's Christmas party season, there was lots of gorgeous dresses to try on. Two bags full of goodies! First off are my little extras! I'd seen the disney socks on Primark's instagram and fell in love with them straight away. There was a few different ones to pick from but I ended up going with a cartoon strip style Cinderella and The Little Mermaid pair. While I was in the sock/tights section, I remembered a Zoella video on her youtube channel where she did a Primark haul and mentioned the Super Cosy tights and how good they were so since it's getting so cold outside, I thought I would give them a go. Next is my big bling spike necklace. This was actually in the sale for £3! And lastly is my little bump hair grip. I've seen these being used in different hair styles and I wanted to attempt them myself! I'm not really sure why I'm putting a picture of my new underwear on the internet but they're so adorable I had to add them to the post. Cute little set for only £4! I had brought a similar vest top to this which I did include in another blog post but I ended up selling that on ebay but as soon as I saw the print on this top, I knew I had to have it. I thought it would look perfect with a skater skirt or just on it's own. 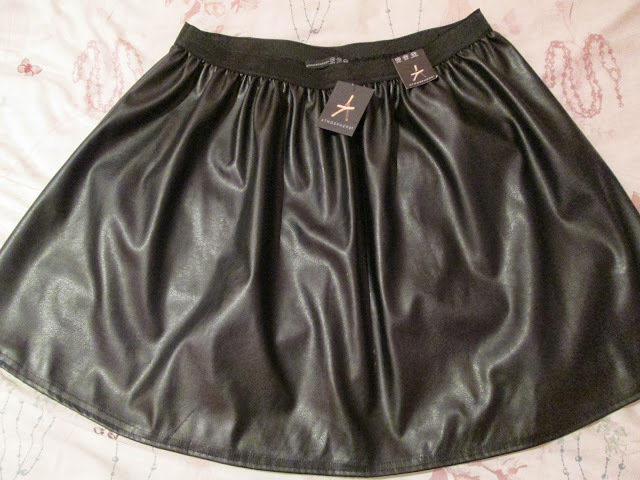 Finally I have a leather skater skirt! I have been looking forever for one in my size and finally Primark delivered. I saw that New Look had theirs on offer for £10 but I thought I'd have a look around Primark first and that's when I spotted one for £8! I'm not sure how long it'll last compared to other high street shops but I honestly don't think I'll wear it that much to wreck it. As if Primark prices aren't good enough, it's even better when they have items in the sale. I brought both of these skater skirts in the sale for £3 each! I tried the black one on a couple of weeks ago but I decided not to buy it which I'm now extremely glad of as I just saved myself £5!